Where do you come on your To Do list? Between juggling the demands of work, potentially toxic friendships, never ending life-min, parenting guilt, trying to be the best partner you can be – or looking for love – life can be totally overwhelming. And for so many of us, it’s the bits we’re not #winning at that appear to be flashing in neon lights as a daily reminder. That’s where kindfulness comes in – blending mindfulness with being kind to yourself. Simply, remembering to treat yourself with kindness in all instances. That means no more self-flagellation over so-called ‘failings’, setting boundaries to get the best out of your relationships and making your emotional wellbeing a priority. 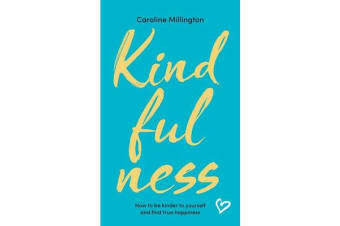 From managing the impact of social media on your mental health to building self-confidence, Kindfulness will help equip readers with the tools they need to have a more positive mindset, put themselves first, identify the triggers in their life which can cause anxiety and generally take better care of themselves.